Getting a chance to see nature close with the wind gushing on your face and adrenalin pumping into your veins is a feeling that can only be experienced when riding a motorcycle. Fun as they may be, motorcycles can be potentially hazardous which is why you need to make sure that you have the proper gear before you jump on one. 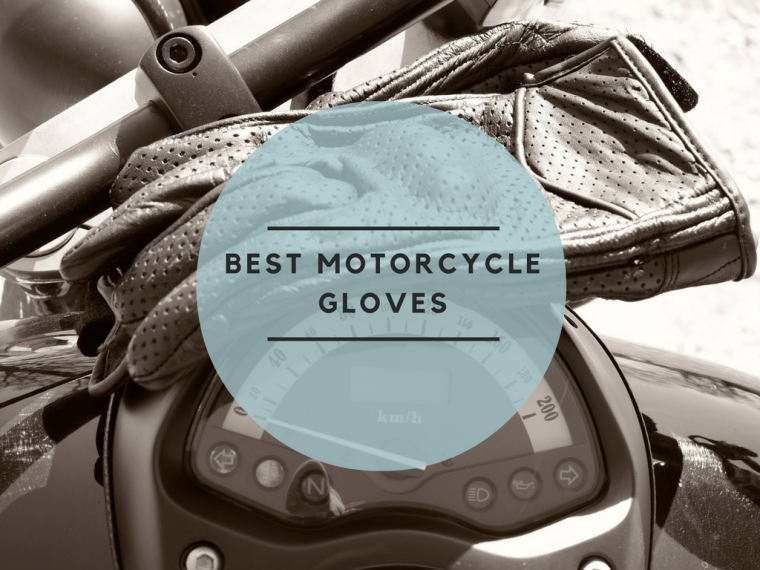 The best motorcycle gloves are part of the gear that you will need. Not only do the gloves keep you safe in the event of a crash, but they are also handy for riders that have sweaty hands. Do I really need to buy motorcycle gloves? Should I pay attention to the glove I buy? Can motorcycle gloves be cleaned? For the serious riders that need some serious protection, it can rarely get better than what this pair of gloves has to offer. They have a broad feature set that can protect your hands from significant injury in case there is an accident. It also helps that they look stylish. For competitive riders or even the enthusiast that does not want to take a chance on their life, Dainese full Metal RS is a pair of bike gloves that you should consider. They offer you optimum protection with creative features and inserts that ensure you’re as safe as can be. Ultimate protection – features in the gloves that are dedicated to protecting the rider include the carbon fiber and titanium inserts on the back and knuckles of the gloves and also that the joints of the fingers. There are TPU inserts on the head and ulna bone of the gloves. Comfort – pre-curved fingers to keep motion comfortable and unaffected, perforation on the inner side of the fingers for better air circulation and soft insert to keep the interior of the glove very comfortable. Long lasting - the gloves have been made from different types of leather which include sheepskin, goatskin and cowhide leather. These contribute to the longevity of the gloves. Tight fit and easy fastening – tightening strap with elastic inserts for a better fit and an adjustable cuff strap. Admittedly, the most interesting part about this product is the solid build and the attention to the protection that has gone into the gloves. The finishing is also quite impressive for a pair that is fitted with so many safety features which you would expect to prioritize safety over looks, but somehow, they were able to sneak a balance between that. For touring and adventure bikers, there is particular attention that needs to be given to keeping yourself safe as you have all the fun. Obviously, that starts with investing in on the best motorcycle gloves there are. This particular pair is built for outdoor fun while delivering comfort and safety beyond measure. The Rev’It Dirt 2 Gloves are built to meet the demands of the outdoors and everything that it throws at every rider. They are built to offer you comfort and safety beyond measure without taking away your ability to react to situations and have full control of the bike. 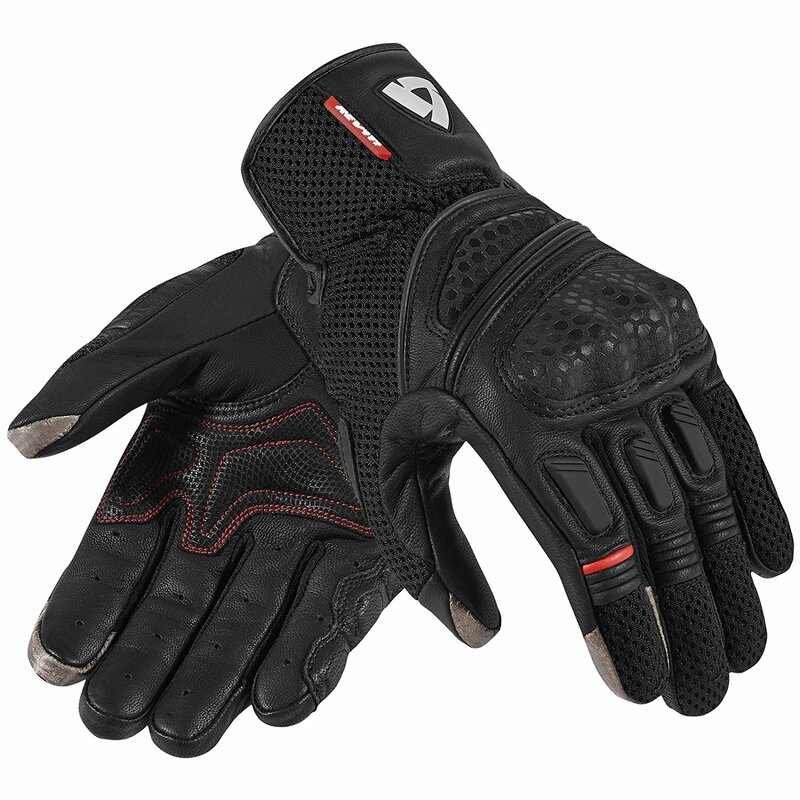 This is why they are considered to be one of the best motorcycle gloves in their category. Lightweight – the gloves are built to offer the rider protection without the heavy feeling. They are very light, flexible and with a lot of ventilation, you will not realize you're wearing them. Touch screen operation – If you need to use your phone or any other touch screen device, the incorporated fingertip connect feature on the gloves allows you to do just that without having to take the glove off. Durable and strong – the gloves are made from goat skin and TPU hard shell to provide the rider with the protection they need and also to make sure that the gloves can last for a long time to come. The biggest takeaway, in this case, has to be the fine balance between functionality and ventilation. The lightweight design of the gloves is also highly commendable and ensures that you have an easy time using and wearing the gloves. If you have to buy a pair of the best motorcycle gloves for how great they look, then these would be a no brainer. Not only do they look great, but they also have cutting edge features that fully protect the hands of the rider and at the same time retain the functionality of their hands. They are a great asset to have especially if there is an accident. Riders that appreciate style, trends and cutting edge technology will surely love what this pair of riding gloves has to offer. They are stunning to the eye, with an exquisitely comfortable feel and all the protection you will need when riding. Some of the additions that this pair has are unique and very innovative which makes them accomplished. Highly durable – unlike most motorcycle gloves that use TPU for the knuckles, these have gone over the top and used steel protection parts for better protection and performance. Needless to mention, they material also lasts longer. Innovative design and features – for better protection and comfort, the steel protection parts on this gloves are made by injection molding and engineered according to the human body. This allows for maximum protection of the joints. The palm protection is made using 3D classic non-slip lines. They strengthen and enhance the anti-slip function. At the same time, this also increases the full grasping conditions. 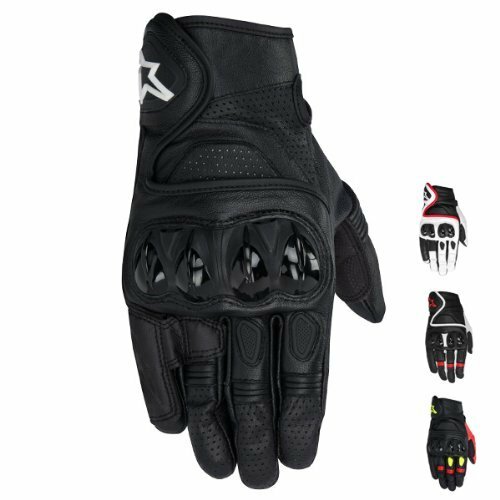 Fashionable – if you’re the kind of rider that pays attention to how good he looks while on their bike, then that is another reason for you to like what these gloves have to offer. The contrast between the black finishing and the steel knuckles is a true beauty to the eye. From the features, you can tell, this is a good pair of gloves. It can hold pretty well on falls and is super thin. It might not be the best glove to use during the winter, but if the temperatures are favorable, it is the most important thing to have on your hands. It is easy to use, structurally sound, and it doesn't hurt that they turn a couple of heads with their looks. 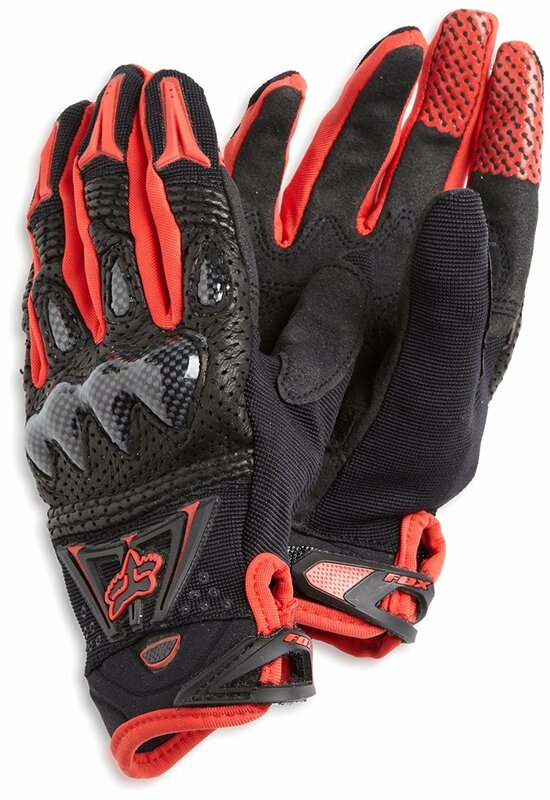 For lovers of speed and street bikes, these are the best motorcycle gloves that will allow you continue having fun but also staying safe. They are a handy addition to have that cannot only keep your hands intact in an accident but will also keep them dry and very comfortable. It is safe to say, that while on a street bike you can never feel too safe. However, with this pair of gloves, you can rest assured that you're safer. With plenty of features and a unique design all dedicated to keeping you safe, there will be plenty about this gloves that will be captivating and help you maintain your edge. Improved protection – the gloves have double layered leather and rubberized padding in the fingers and thumbs to prevent abrasions and absorb impact during a fall. There are also rubber paddings in the palm and wrist to increase comfort and reduce shock. Comfortable – to help improve dexterity and counter hand fatigue, the gloves have a pre-curved palm and finger expansion panels. Comfortable to wear and fasten – the Velcro wrist strap and cuff closure make it much easier for you to wear and fasten the gloves without wasting too much time. Even with the more than an excellent tight fit, this is one of the best motorcycle gloves on the market. It offers the feeling of safety and delivers beyond expectations. It is even better because of the comfort that it can provide which is very commendable. This pair of gloves is proof enough that the best motorcycle gloves do not need to come with a futuristic and very cool design with loads of features. With just the right amount of additions, you should be able to get a great pair of safety riding gloves without suffering from the bulk that would come with such a pair of gloves. With a unique design and approach to gloves for motorcycles, this is a great pair for a rider that is looking for something out of the norm. They are classy, safe and very easy to use. Above all, they also complement the style of the rider. Strong – the gloves come with a full knuckle impact coverage and a main leather body construction for better handling of abrasions. The gloves are designed to form a polycarbonate ballistic plate to keep your hands well protected. Comfortable – to keep your hands nice and cool while wearing the gloves, they feature pittards that make it easier for the air to flow in keeping your hands cool even during the long rides. Warranty – even though this might not be much of a feature it is important to mention it just so you’re aware. The gloves come with a one year warranty which is an extension of the trust that the manufacturer has in their product. This is the one pair of gloves that we would say we see ourselves using comfortable from this day forward. 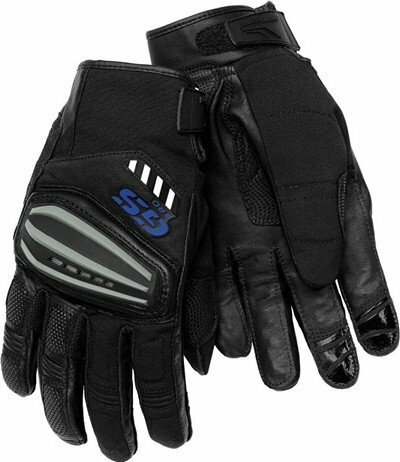 They have a great fit, men’s leather street racing motorcycle gloves. Were it not for the features and the feel that thee gloves have, it would be impossible to believe that they are of good quality. They get a decent rating for the quality, breathability and construction. When it comes to racing, not only are the stakes higher but so are the chances of injury. 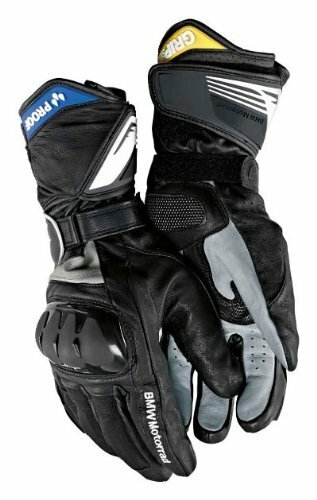 It calls for more protective gear and this gloves for motorcycle racing are a great place to start. You can never be too safe especially when it comes to racing. With the Alpinestars Celer men's leather bike gloves, you have everything you need to keep you safer during a crash. The innovative design also allows you to maintain close to the full mobility of your hands and fingers to meet the demands that come with racing. Innovative design – for riders that want a seamless blend of style and protection. The unique design does not stand out awkwardly, and at the same time, it can offer the protection that is required. Durable and sturdy – the gloves are made from full grain leather. The palm has a reinforced landing zone with PU knuckle protection. Maximum ventilation – for maximum air flow, the gloves feature Perforated leather fingers, finger gussets and on the palms for better cooling performance. Flexibility when riding - considering that these are gloves that are best used when racing, you need to have quick reflexes even when wearing the gloves. To promote that, the gloves have accordion flex panels on the fingers and thumb. They also have a compatible touchscreen fingertip. Easy to use closure – for easy closure, the gloves have a Velcro wrist closure with a TPR flap. This makes them easy to fasten and remove. The only thing there is to hate about this pair is the fact that it is only meant for racing. It would have been great to have something similar for other types of motorcycles as well. One of the most easily noticeable aspects about them is the fact that they are lighter than they look. They also happen to have a better fit than expected. The comfort and the ease of breaking into them will convince you that you have made the right purchase. The pair has a superbly strong build. It is very effective and even has thoughtful additions like the touchscreen fingertip. 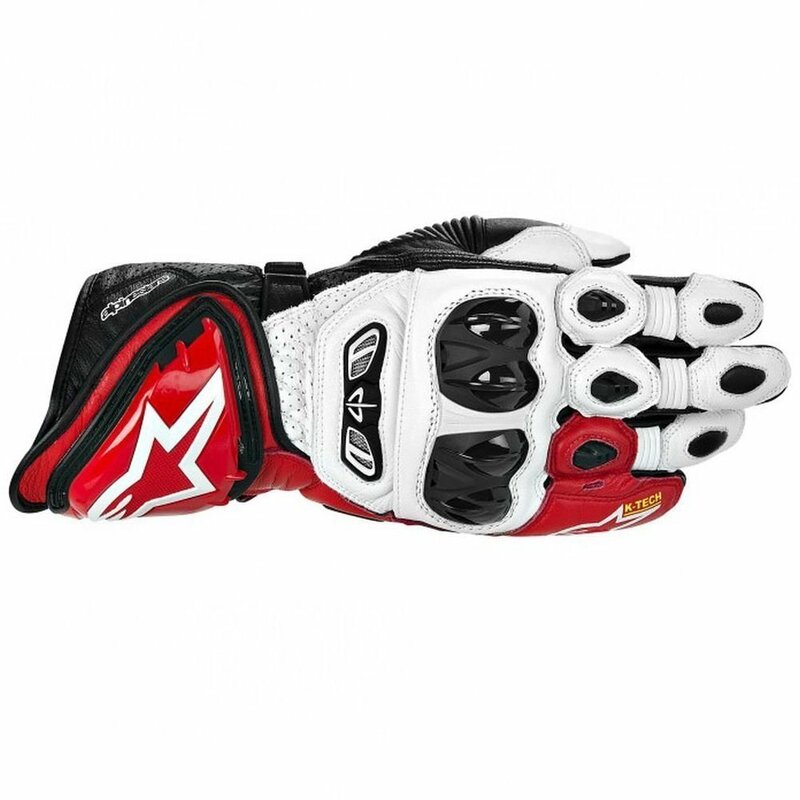 For road motorcycle racers, these are perhaps the best motorcycle gloves that you can come across. They are built to meet the safety and comfort demands that come with this type of riding, and as most riders understand, just like their bikes, gloves for one type of riding is not suitable for another. These gloves meant for men come in a different color combinations which is why most riders might want to pick them up. They also come with a large collection of features that will keep you safe and not jeopardize your competitiveness. Striking design – one of the easily notable features of the gloves is their unique design and availability in different color schemes allowing riders to customize their rides even more. Strong and durable – they are constructed from full grain goat leather around the palm and fingers for better protection. The leather has also been used in the knuckle and finger fourchettes to provide better comfort. Superior impact protection – for areas that are considered key impact zones, the gloves are fitted with TPR protectors and EVA foam, especially on the palm landing zone. The cuff, thumb, fingers and the top of the wrist are EVA foam padded and, the knuckles are fitted with carbon fiber. Comfortable – to prevent the inside of the glove from getting too hot and sweaty, they have ventilations on the finger sidewalls with a wide Velcro wrist closure. There are some features and parts of these gloves that are worth the closing mention. First, you have the highly ergonomic design. It might not be about safety, but it gets you to want to slip the gloves on. They also have a very solid build and are of high quality. All of these are factors that you will notice the moment you get your pair of the best motorcycle gloves. Street racing comes with a lot of demands. It is easy to tell from the designs of the bike the skill of the riders. Given the speed, riders in this niche need to take extra care of themselves and ensure that they have undertaken all the necessary safety precautions. These gloves offer exactly that. Neatly crafted to offer optimum safety to the hands in case of an accident, these gloves also offer you a great use of your hands while keeping them safe. They have a wide variety of features to keep your hands safe at all times without limiting reflexes. Long Lasting – the gloves are largely built from Kangaroo leather. This allows them to last longer and also provide better safety to the rider around the chassis and the palm. Superior protection – the gloves also feature a flexible compound around the knuckles for protection. It also features a Dynamic Friction Shield and dual density construction to shield you from repeated impact. Better fit – to ensure that the glove fits easily and snug, it has external finger to palm seams for a closer fit and better feel. Easier to wear – the cuff is ergonomically designed and reinforced to provide protection to the wrist while making the glove easy to wear and remove. The unique design of this set of motorcycle gloves is the award winner. They have a very protective nature and can meet expectations relatively easily thanks to the wide collection of features. It is one pair of gloves that you will be very pleased to have bought especially if you care about safety. While motorcycles come in all different shapes and sizes, the need to have the best motorcycle gloves for summer never ceases. This is also the case for off-road motorcycle riders, and these pair of gloves are made just for them. Built primarily for off-road riding, this pair of Gloves have the features that will keep you safe while at the same time keeping your hands highly functional and able to react to the quickly changing terrain that comes with the rough riding. They also happen to have a very appealing look. Durable – the gloves are made from durable Kangaroo leather at the palm and also have foam and padding on the back of the hand. This offers added protection to the high-risk areas of the hand. Stretchable – to offer the rider maximum use of their hands, the gloves feature a combination of materials that are stretchable at the backhand. Ventilation – there are ventilation pits between the fingers. These allow for proper circulation of air without compromising safety. Easy wearing and removing – the gloves feature a short neoprene cuff with Velcro fastening. This makes it easier to wear and remove the gloves without much fuss. Quality, immaculate finishing, and safety are just but the few most noticeable upsides about these gloves. However, there is so much more to it. But, you can only be able to experience it. Finding the right words to express all the right things about this pair of riding gloves can be hard. The cold season brings with it new challenges. Freezing of the arms and knuckles can make it hard for you to fully control the bike. Having the best motorcycle gloves for winter during such a time will not only keep your hands warm but will also keep you safe and provide you with a better riding experience. This particular pair is built from high-quality materials with multiple layers each of them with their task to full fill. The complete product is built to offer the rider a superior riding experience and safety even during the chilly weather. Two chamber technology – a unique factor about this pair of gloves is that it comes with two different chambers. There is a thermally insulated chamber that the user can choose if the weather is chilly and there is PROOF moisture protection chamber. It is perfect during the warmer seasons and is highly breathable for better air circulation. Shock absorbing foam – in case of an accident or a fall, the glove has a shock absorbing foam on the ball of the hand. It also has a double thick leather on the edge of the hand. All of these are to protect the hands from injury. 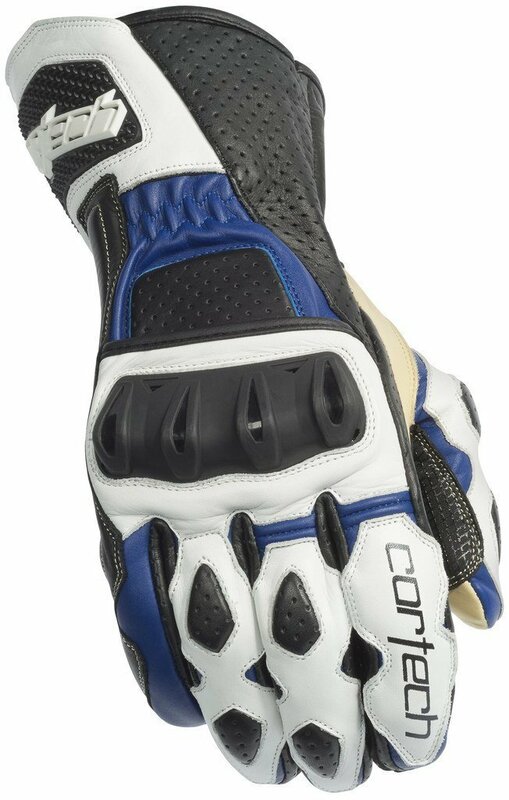 Lightweight design – despite having so many features, the gloves also have a light weight foam on the finger backs. It helps to cut down on the weight of the gloves while still providing enough protection. Easy to remove and wear – the gloves have color markings that make it easy to wear and also to remove. Thermal insulation the rider can choose between the chambers according to the weather. The gloves are a little chunky and heavy. Being able to use a pair of gloves for motorcycles without the fear of getting the eerie wet feeling can be soothing. Which is why this could be the most commendable feature on this pair. The quality and attention to detail in the making of the gloves also takes plenty of credit. Despite being a little expensive, they are definitely the best motorcycle gloves available on the market. When shopping around for the best motorcycle gloves, you want a brand that is reliable and has a proven track record. BMW offers the very best but expensive gloves. Mainly, they have two versions available, one for summer and others for winter. 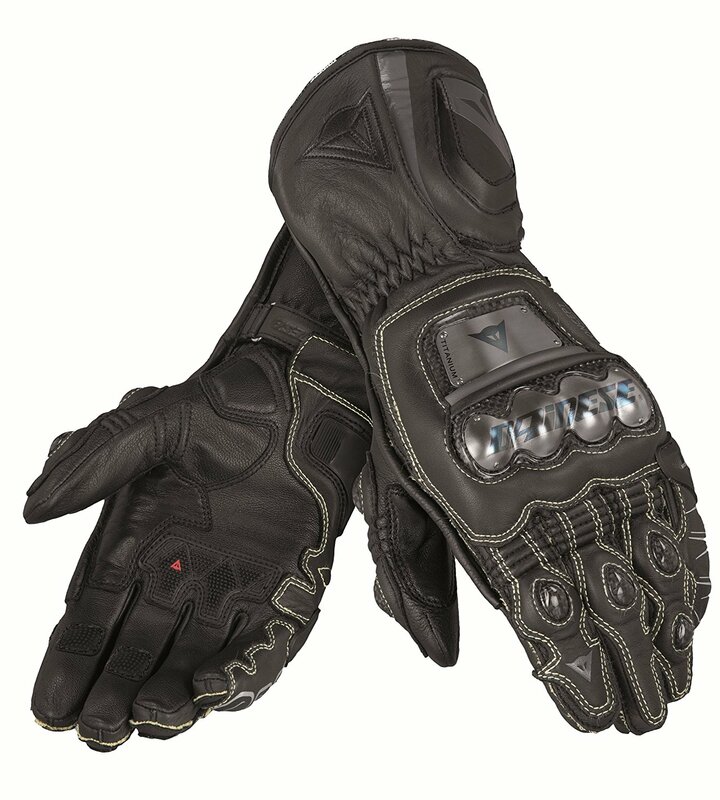 Just like they are a big name in automotive industry, their motorcycle gloves are simply the best in their niche. 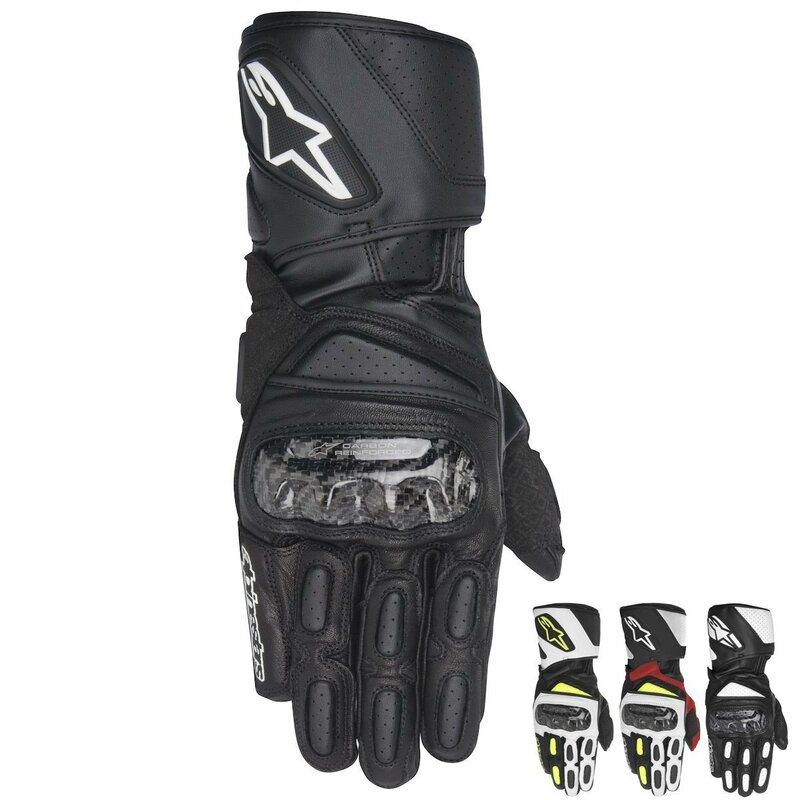 Formed in 1963, Alpinestars is one of the most reputable brands. Over the years, they have made it their business to produce protective gear for racing and biking. Chances are, no one understands protective gear better than them. Rev’IT might not be as old in the market as Alpinestars but, they specialize in motorcycle equipment which goes to show just how effective their products are. The fact that they concentrate on one niche is very impressive since that allows them to have better results and conduct better research. There are a bunch of other brands that also produce pretty good gloves out there. It is best to go and try everything out before you judge a glove by the name. Otherwise, you will rarely go wrong with either of these two. 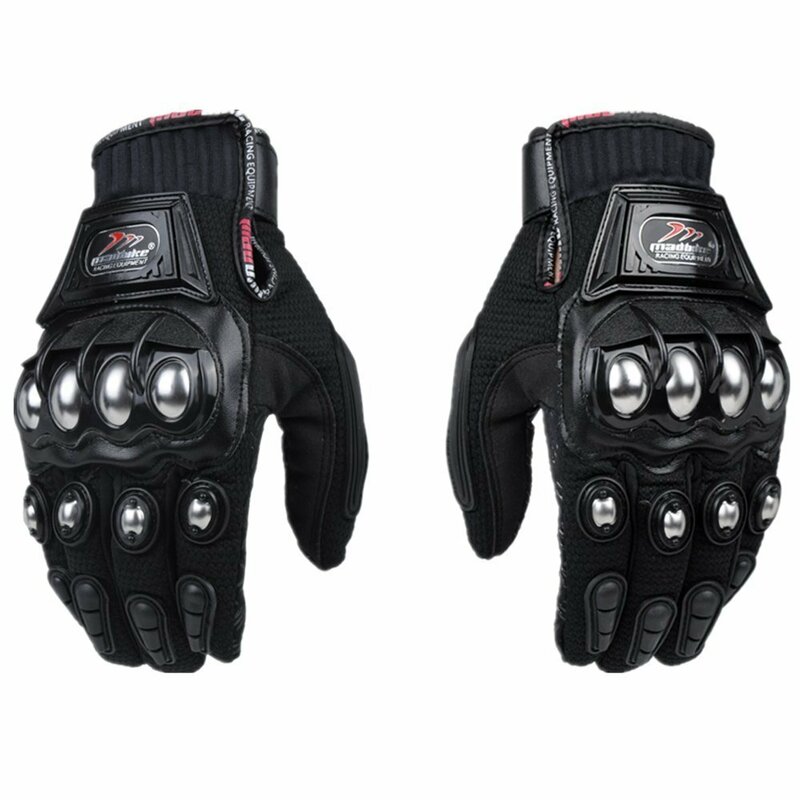 As much as you have to concentrate on the features, choosing a good pair of gloves for motorcycle riding means that first, you have to consider the type of glove that you would like to have. Biking gloves are made specifically to take the kind of brutal beating that is associated with the different types of bikes. Hence the need to make sure that you first pick the right type of glove before you can look at the features it has to offer. Also, for obvious reasons, you’d want to choose the windproof motorcycle gloves . Above everything, every rider is not only looking for a comfortable pair of gloves but one that will also save their skin and bones. Waterproof motorcycle gloves are ideal for bikers who don’t want to stop, even when it’s pouring down. The material used to make the gloves can tell a lot about the overall quality. Full grain leather is usually best. There are other types of material that can be incorporated to make the glove more functional like TPU and steel. For any motorcycle gear, the fit is vital. You don't want it too tight because it kills your functionality and too loose will mean it flies off if you're in an accident. It should be a snug and comfortable fit. It is also a good idea to make sure that you check on the extra features. Extra breathability or even the ability to use your smartphone without taking off the glove could be a great plus. Unless you want your palms and skin to take all the impact and abrasion when you fall, then you need to invest in a pair of good gloves for motorcycle. Also, make sure you wear them every time you're on the bike. No matter how short the distance is. Go to the manufacturer’s website and find your right fit. You probably should for a couple of reasons. One, different gloves are made for different situations and different bikes. You need to buy the one that is meant for the type of bike you have. Two, there are different companies and qualities in the market. Each of them comes with its pros and cons. Of course, the cheaper the glove, the less the protection it will have during a crash. Prolonged use of gloves can lead to building up of sweat and dirt. That creates a bad smell in the gloves which is translated to your hands every time you wear the gloves. Yes, the gloves can be cleaned but, this depends on with the type of glove that you have. If it has a man-made interior, you can just turn it inside-out and wash with some detergent. You can never be too safe on a motorcycle and you never really know when you need the best motorcycle gloves until it’s too late and you have baked hands. With this guide, you should be able to avoid that and get the best possible pair that will cater to all your needs and keep you safe. Now you know how important it’s for the safety and comfort of your hands to have a good pair of gloves. No matter you’re a hobbyist or pro rider, you need the type of gloves that will satisfy your particular needs. But if you are unsure of what type of gloves you need, go with the BMW Genuine Motorcycle Riding Two In One Glove – the best motorcycle gloves, for any biker irrespective of their needs and expectations.